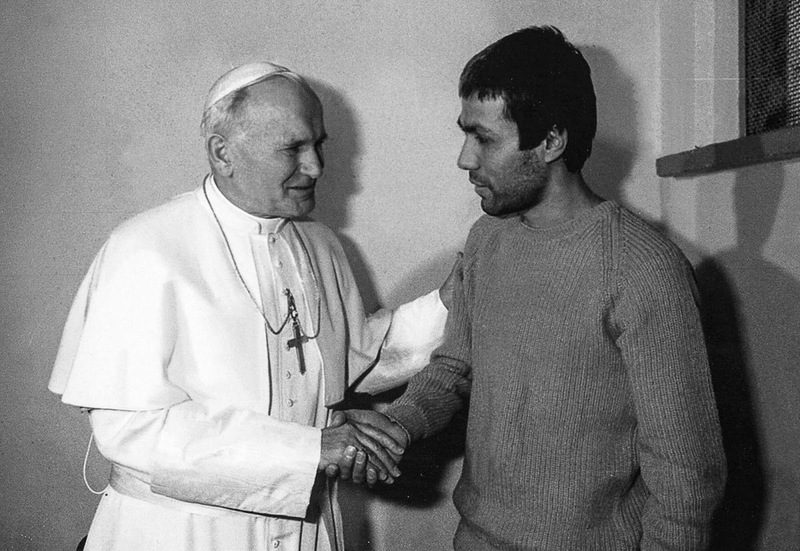 Pope John Paul II visits his would-be assassin Mehmet Ali Ağca in prison. On Wednesday, May 13, 1981, Mehmet Ali Agca pulled a gun and shot Pope John Paul II during a procession in St. Peter’s Square, Vatican City, Italy. Though critically wounded, the Pope survived four gunshot wounds to his abdomen. 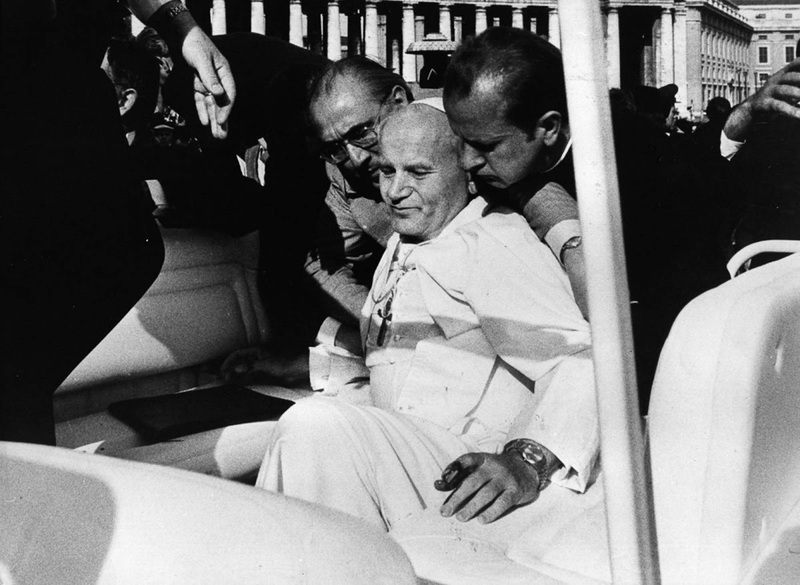 Following the shooting, Pope John Paul II asked people to “pray for my brother…whom I have sincerely forgiven”. 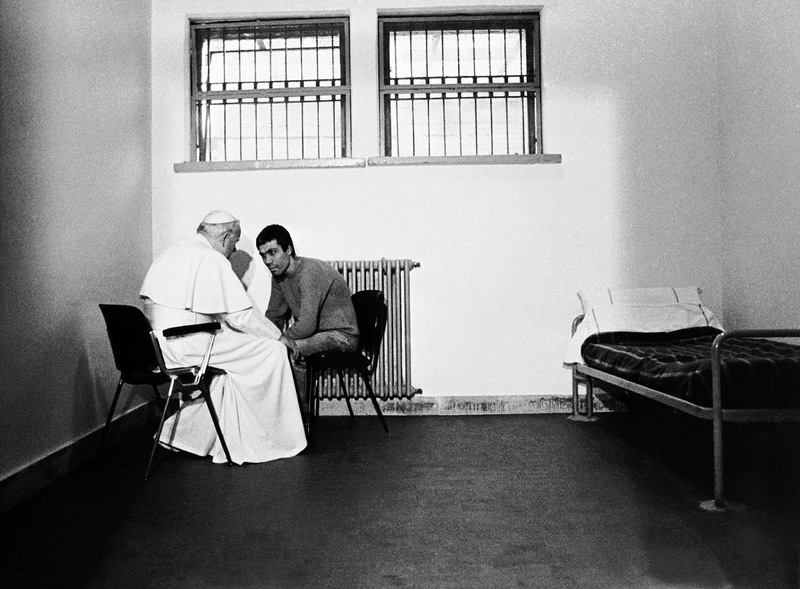 In 1983, Pope John Paul II and Agca met and spoke privately at the prison where Agca was being held. The Pope brought the photographer and the cameramen because he wanted the image in that cell to be shown around a world filled with unforgiving hatreds, with hostile superpowers and smaller, implacable fanaticism. When the Pope arrived in his cell, Agca was dressed in a blue crewneck sweater, jeans and blue-and-white running shoes from which the laces had been removed. He was unshaved. Agca kissed John Paul’s hand. “Do you speak Italian?” the Pope asked. Agca nodded. For 21 minutes, the two men seated themselves, close together, on molded-plastic chairs in a corner of the cell, out of earshot. 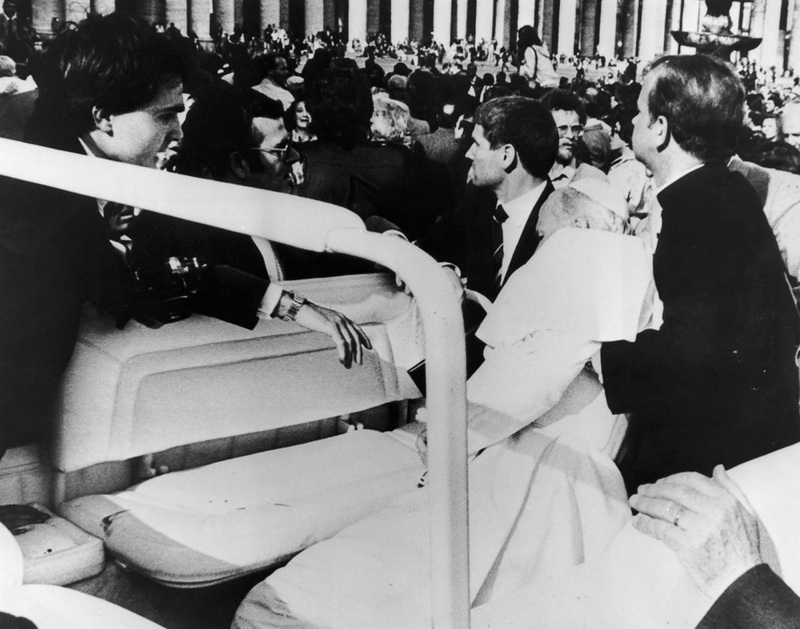 As John Paul rose to leave, the two men shook hands. The Pope gave Agca a small gift in a white box, a rosary in silver and mother-of-pearl. The Pope walked out. Agca was left standing alone, and the camera recorded a sudden look of uncertainty on his face. Perhaps he was thinking about the prospect of spending the rest of his life in jail for attempting to kill a man he did not know, a man who now came to him as a friend. Agca was sentenced, in July 1981, to life imprisonment in Italy for the assassination attempt, but was pardoned by president Carlo Azeglio Ciampi in June 2000 at the Pope’s request. He was then extradited to Turkey, where he was imprisoned for the 1979 murder of left-wing journalist Abdi İpekçi and two bank raids carried out in the 1970s. Despite a plea for early release in November 2004, a Turkish court announced that he would not be eligible for release until 2010. Nonetheless he was released on parole on 12 January 2006. However, on 20 January 2006, the Turkish Supreme Court ruled that his time served in Italy could not be deducted from his Turkish sentence and he was returned to jail. Ağca was released from prison on 18 January 2010, after almost 29 years behind bars. 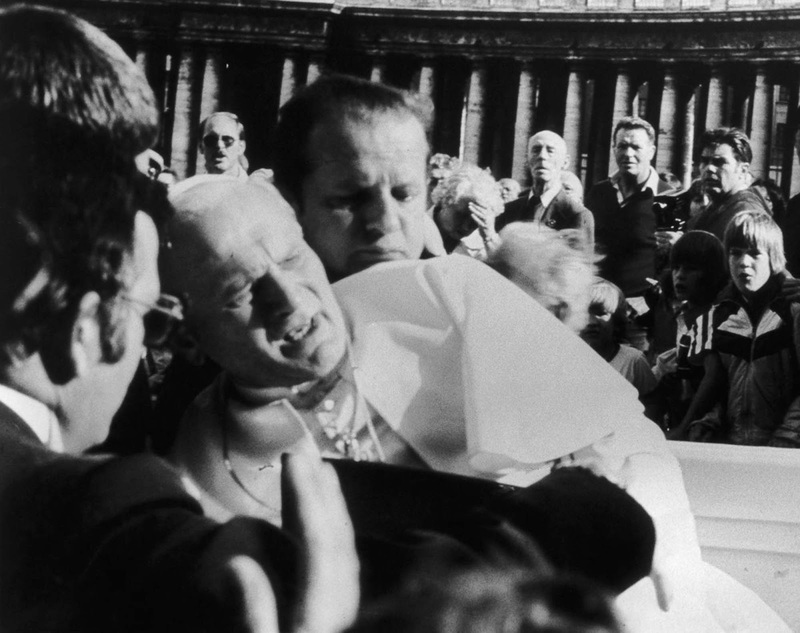 Pope John Paul II in agony after being shot. Pope John Paul II shot down. 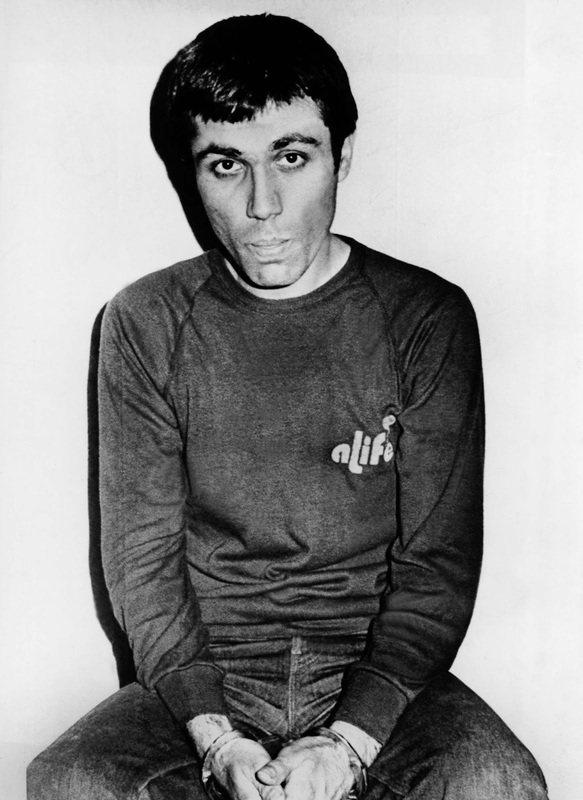 Mehmet Ali Ağca photographed in Turkey after being arrested for the murder of journalist Abdi Ipekçi. 1979. For 21 minutes, the two men seated themselves, close together, on molded-plastic chairs in a corner of the cell, out of earshot. The former assassin visited the tomb of John Paul II on 2014, putting flowers on it. While in prison in 2007, Mehmet Ali Agca converted to Christianity.